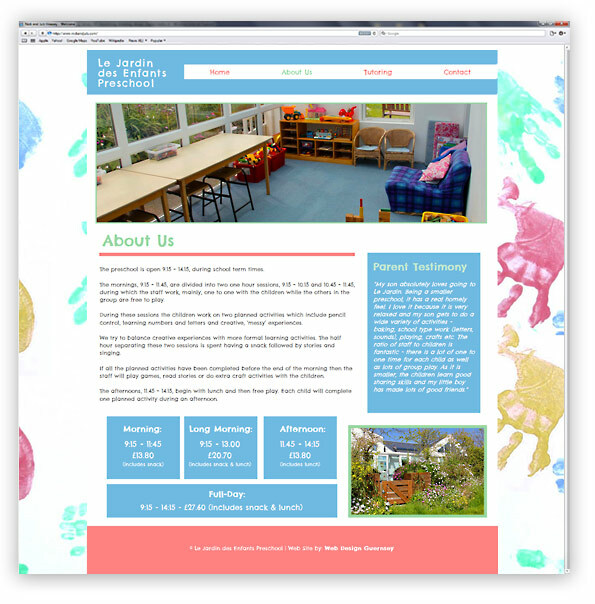 Established in 1990 Le Jardin des Enfants Preschool is situated on the west coast of Guernsey. The Preschool is run by Sally Le Couteur & is housed in a spacious, purpose built extension with a large, safe outside play area. 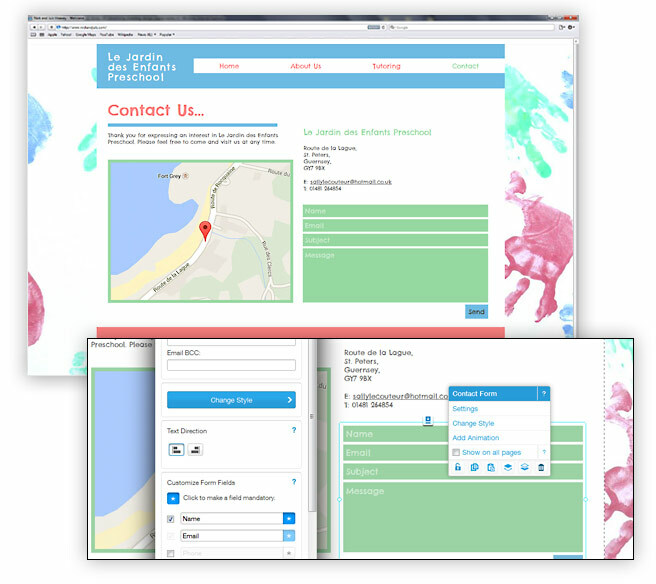 Click here to view the Le Jardin Preschool Guernsey Website. Working with Matt was an absolute pleasure. He was incredibly helpful and always willing to answer any questions or concerns we had about setting up a website. We are really pleased with the end result and I would recommend him to anyone thinking of setting up a website! Client Feedback: Sally Le Couteur, Le Jardin Preschool, Guernsey. 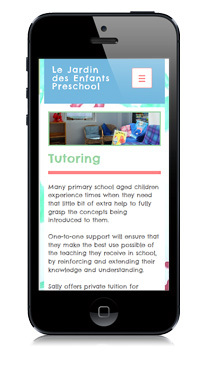 The design of the website needed to reflect the nature of the preschool. A pastel colour scheme was decided upon in the initial brief & was carried through into the design of the website. 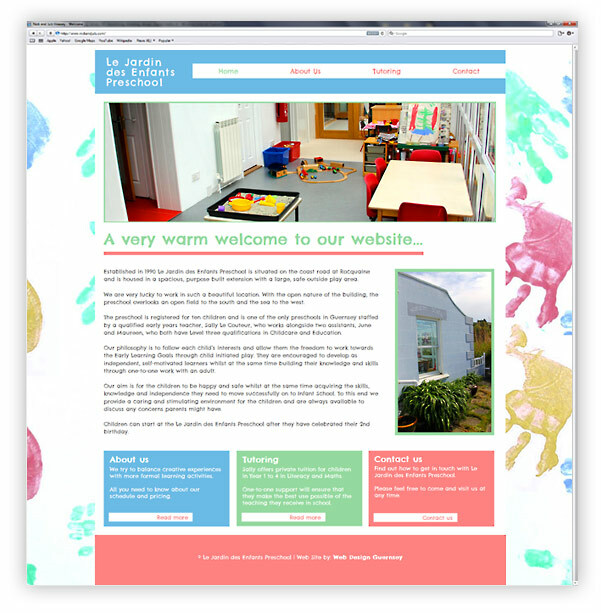 The colourful hand print image (actually produced by Sally’s students) was incorporated into the site’s background. This again gave a visual relationship between the website design & the activities/teaching methods at the preschool. The design of the website was a refreshing change to work on when compared to more ‘corporate’ briefs. It enabled me to incorporate an element of ‘fun’ into the site. The website is also optimised to display on mobile phones and tablets. This type of ‘mobile web design’, which was once a luxury, saved for websites with large budgets, is becoming more and more necessary for ALL websites as internet users increasingly consume web content on the move over a variety of devices. Sally needed to be able to update her website on her own. As she has no website development or html coding skills I built the website on a user-friendly content management system (CMS) web platform. The benefits of having a website that is constantly updated with fresh content means that parents can be kept in the loop with the latest developments and also search engines like Google & Bing will give her site priority over websites with outdated, old content.